It was widely reported that Mr Warren Ernest Warren had been born in Canada although he showed no signs of even the slightest Canadian accent. He and his wife first lived in The Nutshell next to Phlox Cottage, and then bought and refurbished the house where Mr and Mrs Hicks Senior had lived – Jasmine Cottage, which had cascades of jasmine falling down the front of the house. John Saunders took this photograph (Mr Warren) to illustrate countryside deliveries. 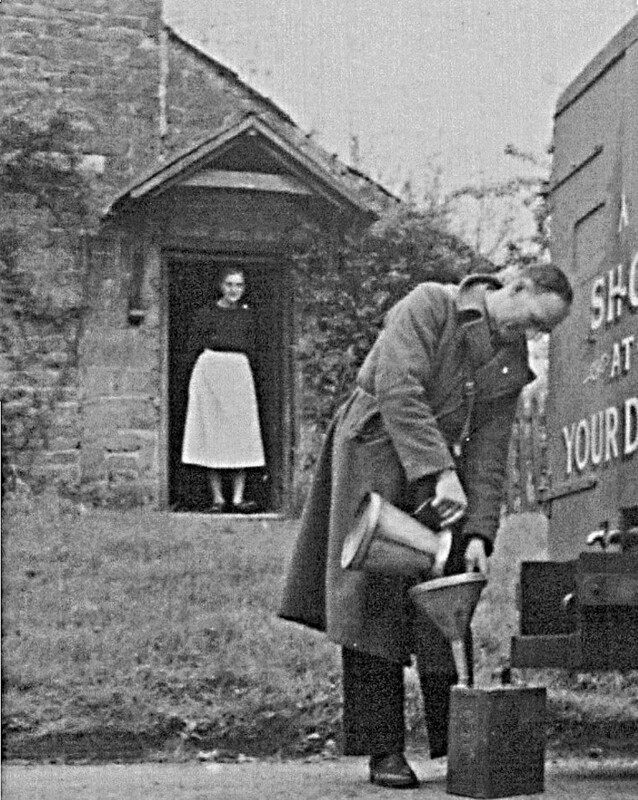 The Shop at your Door oilman delivered to the many households still using paraffin for lighting, cooking and heating. This is one of the few pictures of Mrs Ida Warren, who worked for several families in the village including the Pratts at Essex House and the Saunders next door at Phlox Cottage and then Horley School House. They had two daughters Maudie and Margie (Margaret) who were born in Canada. Mrs Warren regaled us with the tale of how she had been driven to hospital on a sleigh through a winter snowstorm for the birth of one of her daughters. It sounded both romantic and jolly to us, but it could have been neither at the time. Both Maudie and Margie left the area in the late 1940s or early 1950s and rarely returned. Mr Warren was a commercial traveller in the late 1930s, but was also reckoned to have been a book-keeper/accountant at some time in the past. He died in 1971 in the Brackley area. Warren E. Warren was actually born in Hammersmith, London, one of a family of eight children. He worked for a period in Winnipeg Canada in the first decade of the 20th century. It is possible he acquired Canadian citizenship and so it may have been true he was Canadian though not born there. They had hopes of becoming farmers, but either that failed or they tired of the idea. Mr Warren was a pale, small and gaunt man and a prolific smoker. He lived to be 87. There is a good photograph of him in the chapter on the cricket club in a later volume. Extract from A Vanished Past Volume 2 £15 Both Volumes and p&p £33. From Clare Marchant, Shaftesbury House, 15 Circus Street, Greenwich, London SE10 8SN or marchantclare@hotmail. Cheques payable to Clare Marchant. This entry was posted in Modern History and tagged A Vanished Past, Clare Marchant, Cricket Club, Essex House, Phlox Cottage, The Jamines, The Nutshell on November 27, 2015 by thehorleyviews.